This Seattle Times article provides an in-depth look at the complex mix of aging alpine dams, world-renowned wilderness area, and the potential of changing climate patterns in the Icicle Creek Subbasin. The spotlight’s on this North Central Washington region as the 6+ year Icicle Creek Subbasin strategy hit a recent milestone with the release of the project’s Programmatic Environmental Impact Statement. Since 2012, Aspect has been the facilitation and technical lead for this effort, serving a broad working group of city and county agencies, tribes, fisheries, irrigators, and the community. The overall program is designed to improve instream flows, assist in agricultural sustainability, and provide for local domestic growth beyond the year 2050 at an investment of $82 million over the next 10 years. Taking the next step in a process that began in 2012, Chelan County and the Washington State Department of Ecology (Ecology) have released the Draft Programmatic Environmental Impact Statement (PEIS) for the Icicle Creek Water Resource Management Strategy (Icicle Strategy). The Draft PEIS will be summarized and discussed at a public hearing on Wednesday, June 27 from 4pm to 8pm at Leavenworth Festhalle, 1001 Front Street, Leavenworth, WA. The PEIS evaluates five alternatives to help the Icicle Work Group (IWG) map out a solution for instream flow, tribal, agricultural, domestic, and recreational water needs for the Icicle Creek Subbasin in central Washington. See Chelan County’s Icicle Strategy website for more information. Aspect has helped coordinate the development of the PEIS, along with multiple teaming partners and co-leads Chelan County and Ecology. Aspect recently helped facilitate an Open House in Wenatchee to solicit SEPA Scoping comments on the Icicle Strategy, a comprehensive water supply solution for the Icicle Basin in Wenatchee. The following Wenatchee World articles provide a great perspective on the collaborative nature of this effort. We could have had a lawsuit. That’s the modern version of the West’s traditional means of solving disputes over water. You know what they say about whiskey for drinking and water for fighting. But what if you could bring all the combatants together, set shared goals, find common ground, and discover solutions that would meet the needs of all and serve the public good? You could skip the lawsuit, for starters. We know this is farfetched. It sounds like pie-in-the-sky Kum Ba Yah-around-the-campfire idealism. But it is happening, just up the Icicle. 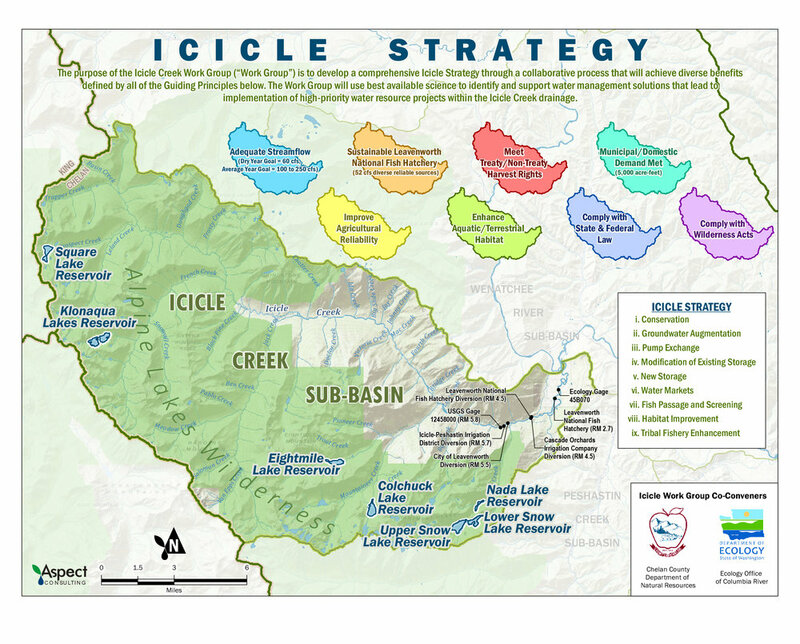 A collaboration known as the Icicle Working Group has released for public comment its water management strategy for the Icicle Basin. The group was formed three years ago at the request of the state Department of Ecology Office of the Columbia River and Chelan County in response to — what else? — a lawsuit over water rights, and decades of chronic problems. Tribes, irrigators, farmers, environmentalists, local, state and federal agencies came together. The goal was to devise a plan that would substantially improve streamflows, sustain the Leavenworth National Fish Hatchery, improve the reliability of the agricultural water supply, enhance Icicle Creek fish habitat, supply additional domestic water, protect tribal and sport fisheries, and do it all within the bounds of federal wilderness law. According to the strategy this would be accomplished first with aggressive conservation. The release valves would be automated on the alpine reservoirs that store runoff for irrigation — Square, Klonaqua, Eightmile, Colchuck, Snow and Nada. Flows could change instantly depending on conditions, instead of having someone hike into the wilderness to turn a wheel. Open irrigation ditches would be replaced by pressurized pipe. The leaky fish hatchery equipment would go and facilities redesigned for efficiency. Domestic water users in Leavenworth and Chelan County would be offered efficiencies through metering and pipe replacement. Perhaps the most controversial project would restore the long-broken perimeter dam at Eightmile Lake and raise the lake to its authorized level. This would increase storage from 1,375 to 2,500 acre feet, and inundate some currently dry wilderness, but provide a substantial benefit in stored water. The efforts they estimate will add 77 cubic feet per second to more than double the Icicle’s base flow in a normal year. It would add 5 cfs for domestic use and 4 cfs for agriculture. The cost of it all is estimated at $65 million to $85 million, so there is far to go. The plan can be viewed at wwrld.us/IcicleWorkGroup. Through whatever prejudice you view water plans, this one has a chance to work where 15 years of fighting failed. The group came together and through give-and-take collaboration designed a water plan to benefit everyone. In itself it is a remarkable achievement, and if we have any wisdom it is an example for many to follow. This is the opinion of The Wenatchee World and its Editorial Board: Publisher Rufus Woods, Managing Editor Cal FitzSimmons and Editorial Page Editor Tracy Warner. Erin McKay, a biologist with Chelan County, explains how a proposed water market would operate at the Icicle Work Group open house in Leavenworth Wednesday. LEAVENWORTH — A comprehensive package of proposals to increase water supply in the Icicle Creek Basin through water-storage automation in the Alpine Lakes Wilderness and aggressive conservation is available for public comment through May 11. If implemented in full, the plan will support area population growth while also supplying fish and irrigators with the water they need through 2050. “Fifteen years ago, we thought it was impossible to come up with solutions for Icicle, and now here we are, we have solutions for Icicle,” Mike Kaputa, director of natural resources for Chelan County. The state Department of Ecology and Chelan County convened the work group in December 2012 in a court-approved effort to use consensus-building instead of litigation to resolve a City of Leavenworth suit against the state Department of Ecology over water rights. Competing interests for Icicle Creek water have made the Icicle Basin and the Leavenworth National Hatchery a contentious battleground, host to a proliferation of past and current lawsuits over water use and rights. If the Icicle Work Group’s plan is successful, the City of Leavenworth/Ecology suit will be dropped. The 11 major proposals in the group’s resulting plan have a collective price tag of an estimated $64.2 million, but are estimated to add an additional 77 cubic feet per second (cfs) flow in the Icicle creek in an average year and 47 more during a drought year. The automation of six high-mountain lakes in the Alpine Wilderness that have been for water storage since the early 1900s. These lakes, Square, Klonaqua, Eightmile, Colchuck, Snow and Nada are equipped with “gates” that now must be operated manually to release flow for irrigation and operations at the Leavenworth National Fish Hatchery. Automation would follow the “Yakima Teacup” model. These are water-storage reservoirs that can be tracked and controlled remotely, using radio signals, solar panels for energy and the Internet. View it at http://wwrld.us/yakimateacup. The system would make it easy to regulate releases when their water-rights holders — the Icicle-Peshastin Irrigation District and (for the Snow Lakes and Nada Lake) the hatchery — need them for operations. The plan would also restore Eightmile Lake to its permitted volume of 2,500 acre feet by repairing a dam there that broke long ago and was never repaired. Aggressive water conservation and upgrades at the Leavenworth National Hatchery. This would include replacing existing raceways — the rectangular, concrete tanks where fish are raised — with circular tanks that can reduce water use by approximately 75 percent. The aged and inefficient hatchery accounts for 42 cfs in surface water use from the creek, another 15 cfs from groundwater wells that are linked to the Icicle Creek and as much as 50 cfs released from the Snow Lakes to supplement Icicle Creek flows. This compares to 2 cfs that the entire City of Leavenworth draws in Icicle Creek surface water. Other measures include replacing open irrigation ditches with pressurized pipeline to reduce waste and leaks; reducing domestic consumption by improving metering, replacing old pipe and promoting low-water landscaping; fish-favorable habitat improvements in Icicle Creek; improvements to a tribal fishing spot near the hatchery and creating or re-establishing fish passage to upper Icicle Creek. The whole package of projects are necessary to achieve the goal of gaining 26,800 additional acre feet of water at a cost per acre foot of $2,400. “You end up with some cheap projects and some expensive projects, but the overall cost of $2,400 per acre foot is still a very affordable cost,” Dan Haller, the Aspect Consulting engineer who helped put the plan together. “In water markets, it’s common for people to pay $1,500 to $3,500 per acre foot. The current public comment period is an optional step, Chelan County’s Kaputa said, to hear what the community thinks about a plan that will impact their city, county, irrigation district, area hatchery and the fish in their neighborhood river. If response to the package of proposals is favorable and receives its environmental approval from the state, more detailed analyses leading to work on then specific projects could begin in fall 2017. “We want people to be aware of that, and get their comments on whether we have the right goals. Is this the best project to meet those goals?” Kaputa said. Send comments by May 11 to Mike Kaputa, mike.kaputa@co.chelan.wa.us or 411 Washington St., Suite 201, Wenatchee, 98801. Icicle strategy poster used in SEPA scoping meeting.